It feels like forever ago since I wrote here but it really hasn’t been. I’ve been slow to respond to comments and I apologize. I’ve been away! I just got back from Las Vegas on Tuesday morning and I’m ready to dive into the Tecumseh Knitalong! If you haven’t already, join the Yards of Happiness Ravelry group (you can join the group even if you don’t plan to knitalong, there will be other threads there eventually). 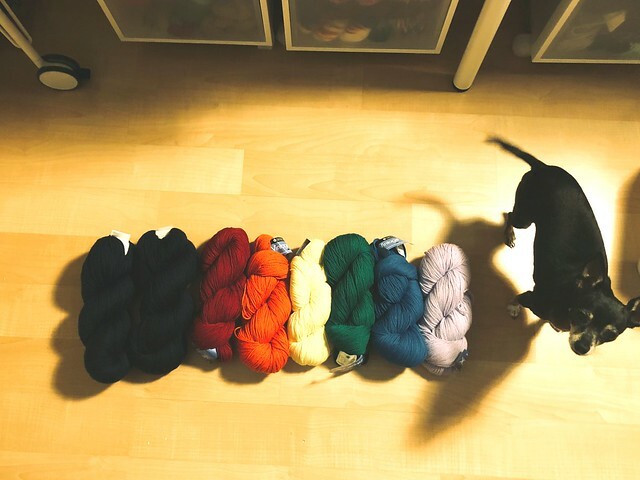 Jellybean helped me pull out my rainbow palette of yarn to take a picture to share with the group last night. Really, after not seeing me for 6 days there was no way possible I was going to do anything without her yesterday. She was stuck to me like glue! My base color with be Miss Babs Yowza in McHale, a deep navy blue and then I’ve created a rainbow with Berroco Vintage DK! Timeline: I wanted us to start around Labor Day (some folks in the group have already made great progress!) but I don’t have a solid end date. I know I fly through sweaters but some people don’t. I’d say, let’s see what we can finish before December. Tips: I’ve been asked a couple of questions but I also saw that while I was away and people had questions they shared with the groups everyone was happy to jump in and assist. Ask away because everyone can give you help and suggestions. Sharing: Share pics in the group and on social media! Add the #TecumsehwithDWJ hashtag to your project pages and your posts so I can see them! And I’ll share my progress and yours as we go along! If you’re just starting to swatch, that’s great! If you’re already on your first round of colorwork, fantastic! There isn’t any pressure or push, I just wanted a group to knit along with me. Happy knitting you guys! Welcome back, hope you enjoyed your bday weekend! 🙂 Knit on!